As a child, I had a ton of GI Joe figures. 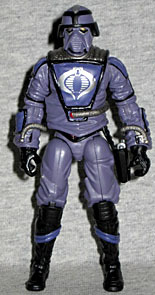 Well, actually, it was a ton of Cobra figures, but you get the idea. I honestly never really gave a crap what the character was supposed to do, as long as he had some interesting equipment and/or a neat mask or helmet. I definitely remember having a Techno-Viper as a kid, but I also never bothered to pay attention to what he was actually supposed to do. Techno-Vipers are Cobra engineers who can build, rebuild, and retrofit anything from weapons to fortresses. They use whatever materials they have on hand, and send troopers to "take" what they need to complete their project. Their engineering creations are usually powerful, effective and full of deadly surprises. I really don't see why the word "take" is in quotes on the filecard... maybe if it had said "borrow" or something, the quotes would imply sarcasm, but "taking" is pretty much exactly what they're implying. Anyway, it's kind of neat to think that these are the guys building the HISS tanks and Flight Pods and all those other nifty Cobra vehicles. Still, it's a pretty narrow purpose, but my fondness for the original got to me, and I eventually picked one up (mostly out of frustration that I couldn't find his wave-mate, Renegades Storm Shadow). The Techno-Viper is an almost note-for-note update of his predecessor, and gets a lot of new parts for such a fringe character. His frowny-face helmet is front and center, and there are thick tubes snaking around his forearms and waist. His outfit is pretty baggy, with lots of sculpted folds and wrinkles in the clothing. He's much baggier than the G1 Techno-Viper (who was kinda baggy for G1), but he's also baggy compared to most other G3 figures. He's not quite at Hazard-Viper levels, but check out those sleeves! He's not far off. Otherwise, almost every element from the old school T-V is present on this version, but tweaked to reflect the detail we expect from modern Hasbro figures. 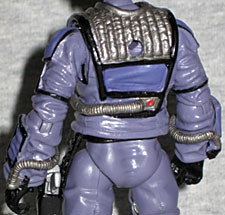 The webgear is nice, but like far too many G3 Joe figures, it flares out on the side with the clasp. I wish they made the web gear out of harder or thicker plastic, so it could look closed. On figures with this much detail, it's odd to find such a toy-ish element. The color matches the 1987 Techno-Viper in spirit, but trades the bright royal purple and magenta for more muted shades of lilac. The rest is silver and black, and the giant Cobra tampo on the chest is particularly clean and well done. His backpack, unpainted black in the original version, now gets some red and silver for the tanks. The paint is very clean for this scale. All the original accessories are present here, updated for the modern era. He's got his "welder pistol" which is a large gun with a strange triangular barrel, and three different tools: a pneumatic shear, a hammer and a claw, if the filecard is to be believed. The tools fit in slots in his backpack, just as they did on the original. There's a hose that plugs into the backpack and can also plug into any of the tools or the welder pistol. There's also a small hole on the back of a dial on the backpack; the welder pistol's hose peg fits pretty well in there so the gun can be stored. 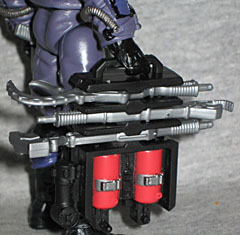 The backpack has a handle on the bottom, so it can be carried around rather than plugged into his back if desired. He's also got some cool new gear. A silver pistol (the same mold as the G3 Iron Grenadier) fits in a working holster on his left hip, which is a nice nod to the non-functional pouch on the original figure. The last accessory is by far the neatest: a Cobra traffic cone! 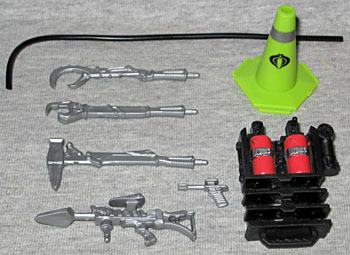 Sculpted with a hexagonal base (with clips so that it can interlock with other cones), it's molded in bright yellow-green (like a Constructicon) with a silver band near the top of the cone and a black Cobra sigil below that. There's a hole in the top of the cone, where theoretically some type of pole could fit, if you had one. The Techno-Viper is a nice update of his original version, but he is admittedly not a figure everyone is going to be interested in. He's got a neat design and the traffic cone is pretty spiffy, but there's nothing that really makes him an essential figure. Still, somebody at Hasbro must have a soft spot for the guy, because he ended up being a pretty fun, versatile figure with a lot of new tooling.